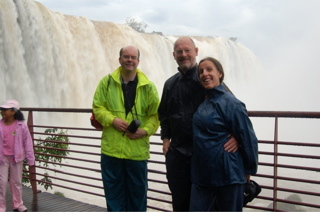 We made the most of our friend Paul’s visit by escaping for a couple days to visit the Iguazu falls, on the borders of Argentina, Brazil, and Paraguay. 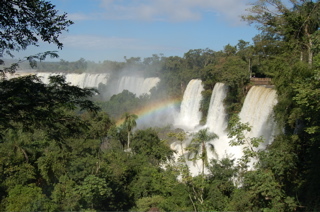 Iguazu is a national park, and the location of a range of huge waterfalls. In fact, in some measurements they are actually bigger than Niagra, but of course they aren’t as well known because they are in South rather than North America. 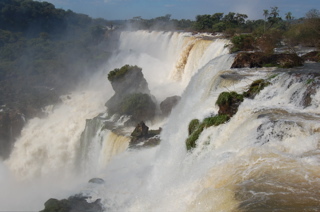 Experiencing the sheer power of the water was absolutely amazing, partly because they have had a very rainy summer in the north-east corner, province of Misiones, and there was about four times the seasonal average volume of water coming over the falls, making it all jolly spectacular. It also meant that a lot of the walkways were rather wet, we got soaked several times which is all part of the experience really. 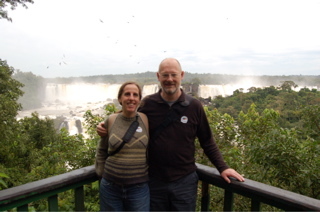 This shot is of San Martin fall, taken from the Argentinian side. This is where the guide took us having told us “now we are going to see some of the lesser falls”. We saw both the Argentinian side and Brazilian, and were also briefly in Paraguay, although the city on the Paraguayan side is rather a dive, and only really exists because of the contraband, which moves openly across the border in astonishing quantities. 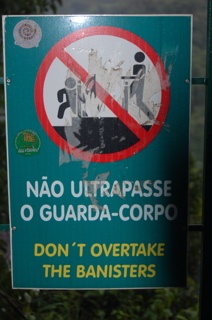 This footpath sign was one of our favourite “English” translations. It meant to say “Don’t cross the barriers”, but we think it’s probably better as it is. Another good one was a sign inside the little tourist train which read “When the train is in motion, please do not stick your extremities out of the yellow lines”. The wildlife in the national park could be out of a childrens’ picture book. Some of the colours were even brighter than our friend Paul’s yellow raincoat, especially the butterflies, and the toucans. We also saw wild guinea pigs, coatis, and a whole cloud of black vultures. There are also six kinds of wild cats, including jaguars and pumas, but they’re night hunters and I imagine they keep themselves scarce when the place is full of visitors in the daytime. The park closes in the evenings to preserve the habitat for the wildlife. – “No, we don’t need to, they prayed to receive Jesus a couple of weeks ago”. So I took my tiny shred of patience with both hands and suggested that it might be OK for them to pray more than once in their lives. We have a friend staying with us at the moment from the UK. We went to meet him in Buenos Aires and spent a few days touristing there, before bringing him to Cordoba with us to experience some real life. If you’re ever in Buenos Aires, the obligatory tourist circuit includes; the Plaza de Mayo (the main square), at one end of which is the Casa Rosada (the pink equivalent of the White House), Calle Florida (very busy pedestrianised street in the heart of the CBD), Avenida Corrientes (one of the most important arterial streets, with lots of activity both day and night), Caminita (area on the port with brightly painted houses, used to be one of the poorest neighbourhoods, now attracts plenty of tourist dollars), La Boca stadium (home of Boca Juniors football team) and Tigre (town on the river delta). From Tigre we took a boat through the delta, ending up in the town of Carmelo on the Uruguayan side of the river. The trip through the delta was interesting, and of course the border crossing meant that our friend received his all important Uruguayan passport stamp. I can imagine Carmelo might be quite a sweet little town in sunshine, but as it was cold and drizzling, we ran out of ideas for entertainment quite early, hence we lurched from coffee, to lunch, to ice-cream, before catching the boat back to Tigre. One day we branched out and went out to see our friends Ramon and Francis in Rafael Castillo. Rafael Castillo is a neighbourhood about an hour and a half away from the city centre, and definitely not on the tourist circuit, which is a shame, because it’s a great neighbourhood; Hazel lived and worked there for two years, and some of my favourite people in the world are in Rafael Castillo. When you pluck up the courage to visit, you will find that people are warm and welcoming, there is a strong sense of community, there are virtually no multi-national corporations, the ice-cream is great, as is the meat which is sold from road-side barbecues at lunch time.